Interested apprentices are highly encouraged to thoroughly read the below Program Overview and download the full Apprenticeship Description here. Specific information about expectations, work, costs, what to bring, start dates, etc. are described in-depth in this document. If you are interested in our program after reading these pages, please complete the Online Apprenticeship Application. Once we have received your application we will let you know about available space and set up a phone interview with the best prospective applicants. Check out our 2019 Apprentice Team. For a shorter program opportunity, consider applying to our Internship Program. Participants in Rancho Mastatal's Apprenticeship in Sustainable Living live and work with amazing people at the Ranch and in Mastatal. They make lifelong friends, participating in a style of living that oftentimes changes them forever. 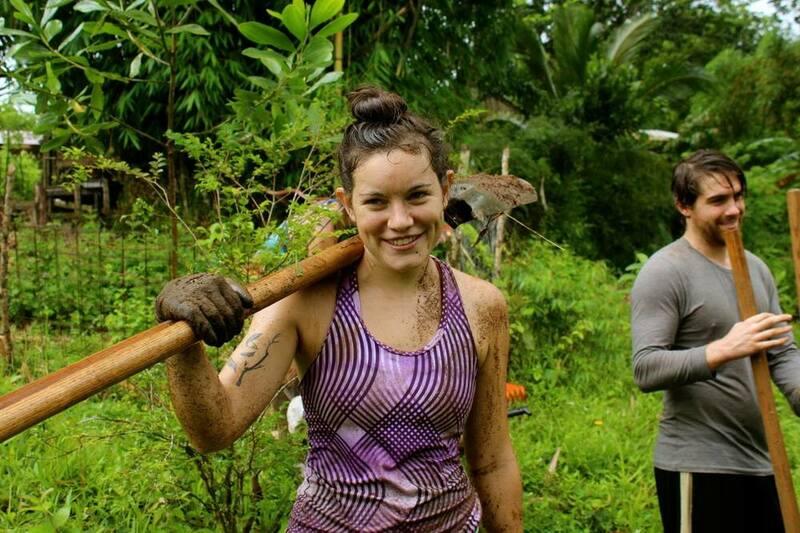 This experience offers the unique opportunity to become a part of the magic and beauty of a remote area of Costa Rica, while simultaneously learning tangible skills to take back home. Empower individuals who are genuinely interested in creating a more sustainable world. Be a “living laboratory” for experiential education and the learning and daily practice of life-long skills. Inspire and enable individuals to continue to develop creative solutions and generate positive social change and sustainable practices in their own lives and communities after they leave. Prepare a group of capable individuals to help manage and care-take the Ranch during the months of August, September, October and November. Provide post-apprenticeship support through our networks. We offer five-seven positions for our year-long apprenticeship. The cost of our 2020 program is $6,300 and includes all meals, lodging and the following classes/courses: Timber Frame Construction, Natural Building & Plasters Intensive, Permaculture Design Certification, Plants as Medicine: Reclaiming the Art of the Home Apothecary or Agroforestry Skills: Plan a Fruit Farm or Forest, and Wilderness First Responder (including certification). The details of this apprentice course list may change slightly as we finalize our schedule. Culinary arts—creating nutritious, flavorful, meals where there is no grocery store! No boxes, cans, or bottles. The area of focus for the apprenticeship will depend on the interests and goals of each apprentice as well as the overall needs of the community. In addition to daily work on individual and group projects, each apprentice is expected to help cook, clean, and otherwise become an integral part of the Ranch team. During your time in Mastatal, you will become a part of an intimate group of individuals. It is, without exception, a life-changing experience for all participants. The following are some of our anticipated projects and focuses for the upcoming year. Apprentices are expected to get involved and take leadership roles in much of this work. Please note—only a few of these projects will be underway at any given time and projects will inevitably change throughout the year. Apprentice will also have training in furniture building and will have a progression of skill building in the workshop. There may be further opportunities to work on other projects during the course of the apprenticeship. Food Processing and Preservation: As our agroforestry system slowly matures, we reap the benefits of fresh and delicious fruits, greens, nuts, and tubers. Interns will have the opportunity to learn how to harvest and process many types of local foods, learn preservation techniques, and make value added products like dried spices, natural sodas and herbal wines, fruit vinegar, fermented vegetables, and much more. Food Processing Equipment: We will continue to increase our ability to utilize and preserve food by improving our facility and food processing tools. Potential projects will be designing and building furniture and food processing equipment like a juicer, solar dehydrator, wine casks, and others. Site Analysis and Design: We will be implementing an integrated design for our perennial and annual garden beds. Interns will learn how to address common challenges like erosion control, water management, and seasonal usage patterns. Erosion Control: The tremendous force of four meters of rain per year creates a major need for redundant erosion control strategies. Using Vetiver grass and contour swales to slow, spread, and sink water into our landscape will continue to be an important project. Fruit and Nut Tree Plantings: Once the rains arrive in April, apprentices will be heavily involved with the expansion of our orchards. In particular this season, we will be focusing on tree crops that will give us a source of healthy protein in the future. Nursery Work: As the demand for perennial vegetables, fruit trees, and other plants we work with continues to increase, we will be significantly scaling up our nursery. 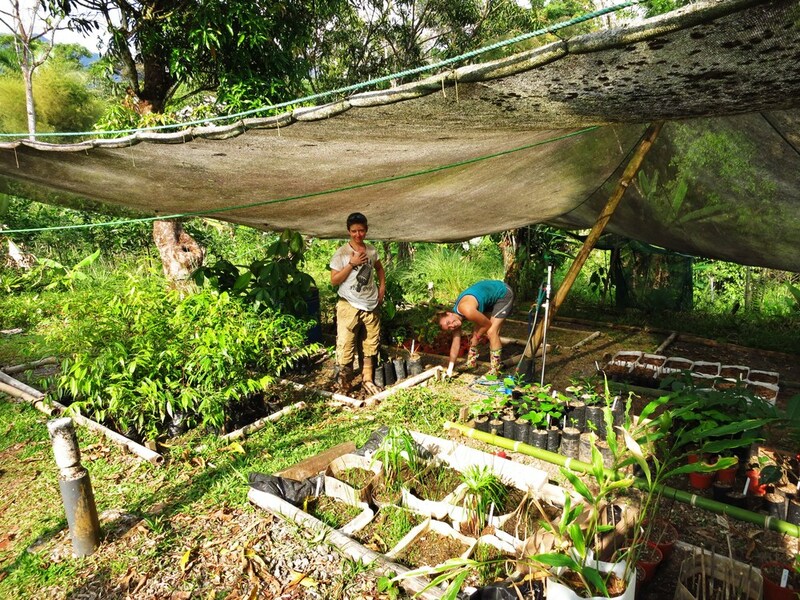 From bagging hundreds of plants, to practicing grafting, to designing our fledgling nursery space, there is no shortage of work in this area.